My hair has always taken a beating during the summer. I'm a natural blonde which means I spent many years of my childhood with green hair from the pool. I also have very oily, fine hair that gets tangled easily. Between the sun, pool, beach, and the wind my hair needs some serious repair work. 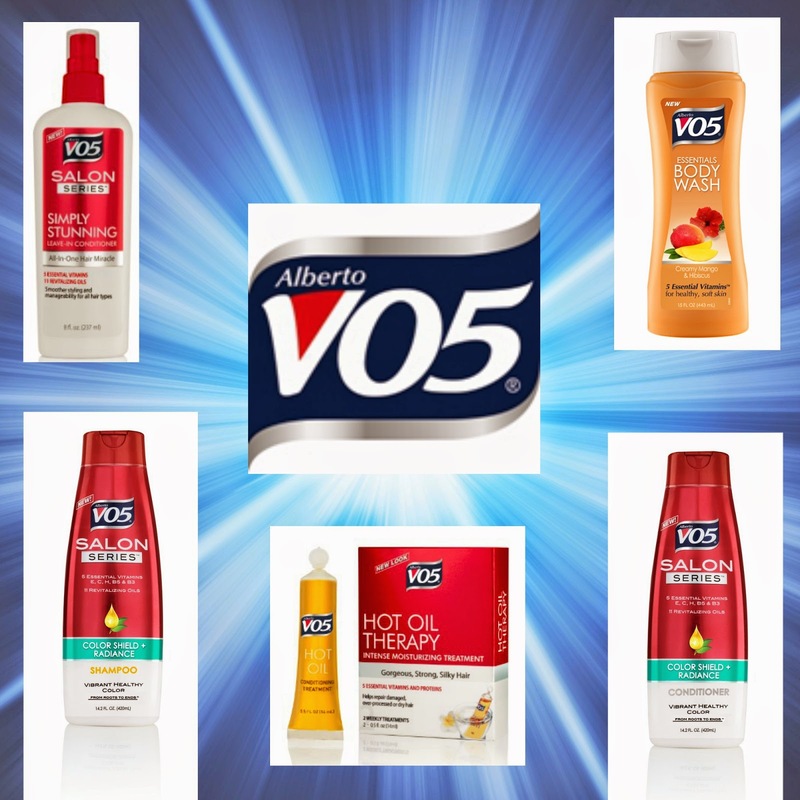 I was sent a sample of V05 products to try this summer in exchange for this review. All opinions are mine and no further compensation was provided. It's fun getting new products to try in the mail, especially in the summer when I'm trying to take better care of my hair. It was great seeing some products that I've used in the past as well as some new products. I use the standard V05 shampoo and conditioner on my kids' hair. I like that it's a little watery but gets a great lather going. My kids think they needs tons of shampoo to get the job done and the consistency of V05 makes them think I gave them more shampoo than they actually are using. I always use hair care products that add volume. My baby fine hair needs all the help it can get. Normally full body products don't add any shine to your hair but the V05 Full Body + Shine contains coconut oil which added great shine to my hair. I didn't see a huge difference in volume from the other shampoo and conditioners that I have tried, but I did see a huge difference in shine and softness. The Full Body + Shine Shampoo formula has the same watery consistency as their other product lines. It also works up a great lather! During the cooler months I don't use leave in conditioner often. In the summer I use leave in conditioner after every trip to the pool, beach, or lake. Have you ever tried brushing your hair after swimming all day only to find your hair a tangled mess? With just a few spritz of V05 Series Simply Stunning Leave-In Conditioner the brush goes right through your hair. While it's great for my hair, it's even better for my daughters' hair. Mostly because using the leave in conditioner means they are not crying while I brush their hair! Talk about a win! I can't imagine how their hair gets so messy! I've actually used V05's Hot Oil Treatment since I was a teenager. I haven't used it in years though. It brought back memories doing my first hair treatment. I gave my daughters a treatment at the same time as part of a little spa day. We refer to my youngest daughter's hair as a lion mane. She has long, thick, hair that makes me just a little jealous. After her hot oil treatment her hair looked amazing! I was shocked at the difference just one treatment made on her hair. I'm going to add this to her hair routine. Here is a little information about V05 Products. You can learn more on V05's website. VO5’s Hot Oil Treatment - A hair care staple, it moisturizes and conditions hair from roots to ends, helping to restore shine, strength and silky softness. VO5 Salon Series Full Body + Shine Shampoo and Conditioner with coconut oil and conditioning agents weightlessly coats and plumps each hair strand, delivering a visible boost from roots to ends. VO5 Salon Series Simply Stunning Leave-In Conditioner is a daily secret weapon, helping protect hair from heat and strengthen against split ends and breakage. Alberto VO5’s NEW! Essentials Body Wash moisturizes your skin with the legendary VO5 5 Essential Vitamins formula. Want to win a collection of V05 products? One lucky reader will win the same products I reviewed. Enter on the Rafflecopter form. I seem to use conditioner more often in the summer. My hair care routine doesn't change in the summer. I have to watch with the chlorine and salt water- really rinse and condition! Hmm...it doesn't. Is that bad? I often go to bed with a wet head! But sometimes I don't change much. It really depends on how active I've been that day. My hair is frizzy in the summer. i remember using the hot oil treatments. That brings back memories. I let my hair air dry in the summer. It's too hot to use the dryer. My hair definitely gets a bit frizzier, but I don't actually do anything differently.